I’m a 50 something, recently retired elementary school teacher, who has always loved fashion. 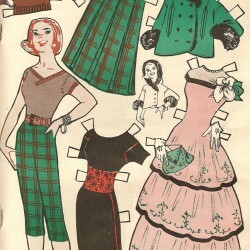 I began my love for fashion as early as 8 years old when I would purchase paper dolls, and they would each only have 5-10 outfits…really now, that can hardly be classified as a wardrobe, don’t you agree? 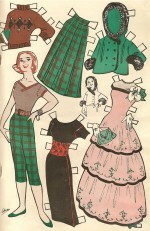 To solve this problem, I would draw outfits, complete with shoes, using colored pencils, or out-of-date pattern books. I would size up Peggy, Anne, Jill or, my favorite, Kathy, to see which doll would fit the size and shape of the featured outfit and I would add this new creation to her existing wardrobe. I was a stay-at-home mom to my 3 sons for 12 years and then went back to school and received degrees in Special Education and Elementary Education. I received my Master’s Degree once my sons went to college. When I was teaching I always took pride in my appearance and tried to make as many combinations as possible with my different clothing items. I loved it when my 6-year old students or staff member would comment on how nice I looked. I was often asked for fashion advice from parents or teachers and, at times, accompanied them shopping for my fashion opinion. It was always rewarding to choose styles and colors that my friends had never thought of wearing before and once they tried them on would say, “I never would have picked that item…I love it!! The goal of my blog is to share ideas for women of all ages, primarily “Baby Boomer” women, who might be experiencing changes to their bodies and may not be sure how to dress to compliment the changes. I’m hopeful that the ideas I share with you in my blog will be implemented and women’s self-esteem will improve and women will feel more confident about their appearance.